Connective Tissue Oncology Society Annual Meeting (CTOS), Maui, Hawaii · 2017, Galon J. et al. The enclosed abstract was presented at the 2017 Connective Tissue Oncology Society Annual Meeting (CTOS), Maui, Hawaii. 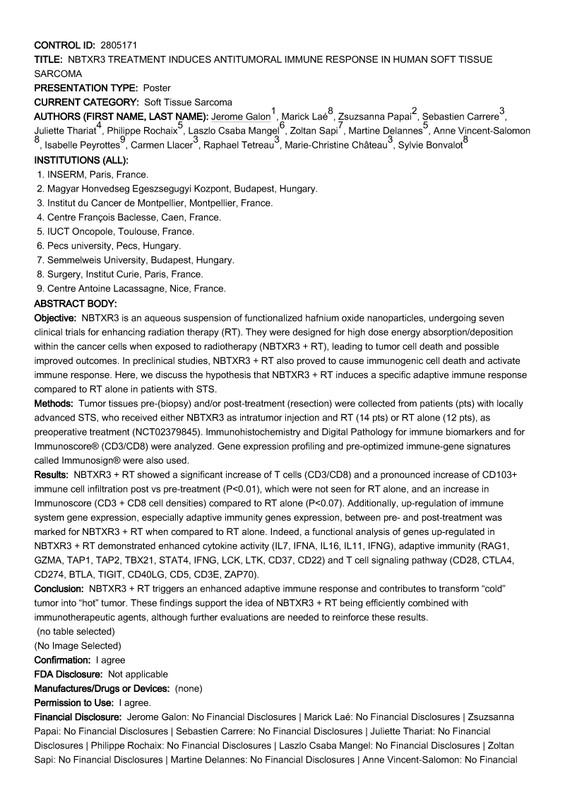 The abstract NBTXR3 Treatment Induces Antitumoral Immune Response in Human Soft Tissue Sarcoma describes how NBTXR3 activated by RT triggers an enhanced adaptive immune response and contributes to transform “cold” tumor into “hot” tumor.